On Sunday, WWE presented the No Way Out pay per view for the first time in three years. And the title was appropriate for the corner WWE had booked themselves into with the stipulation on the main event. With either John Cena or John Laurinitis set to be fired depending on the outcome of the match, my friend I was watching the show with made the observation WWE was damned if they do, damned if they don’t. Either John Cena loses and gets fired then the creative team has to find a way for the number one guy in the company to be back on the roster in time for either the next pay per view or the 1,000th RAW, or Big Show loses and John Laurinitis gets fired which would satisfy the fans who are sick of People Power, yet once again John Cena wins. I had thought about doing this recap in a Good, Bad and Ugly format only calling it Centsible, Centsless and Abcent Minded cause I like a good play on words. However, the more I was thinking about it I the more I realized I had more to say concerning certain aspects of the show then I did about the actual matches. So here’s a quick recap of what happened followed by a stream of conscious thoughts. Ryback vs. "2 Local Athletes"
I’m paying for this? Once again there were three unannounced matches thrown onto the show. Two of the matches were matches we’ve seen numerous times before. Apparently Sin Cara can only work with Hunico. I know Sin Cara just returned from injury, but it’s time to move him on to other opponents. Or let Hunico win some of the matches so there’s at least a tiny bit of unpredictability to who will win. As much as I like Ryback, seeing him squash two no-names on a $45 show isn’t something I want to witness. Keep the unknowns on RAW and Smackdown. I had made the snarky comment to Kevin that Triple H’s promo would get more time then half the matches on the show. While I was surprised Haitch kept his talking relatively short and to the point, again why was this on a show people paid to see and a show that has less viewers than the weekly TV programs? While I’m not excited for it, I realize the majority of the WWE fan base will be interested in the HHH/Lesnar match. I think the announcement would have played better on RAW then on the pay per view. WWE needs to realize when fans are paying for the show; the show should be worth paying for. WHO ARE THESE GUYS? I thought the tag team Four-Way was a really good match and the wrestlers put on a great display of their talents. However, when was the last time any of these guys were on RAW or Smackdown? This may seem insulting or come off in a holier than thou manner, but I honestly see WWE fans as sheep 98% of the time. WWE fans will cheer, boo, chant or tweet whatever WWE tells them. And unfortunately WWE has told the fans tag team wrestling doesn’t matter. So while The Primetime Players, The Usos, Primo/Epico and Tyson Kidd/Justin Gabriel may put on a good match and the fans may cheer for a big move, the majority of the match happens with fans sitting on their hands. Hopefully this match is the first step in rebuilding the tag team division. While the fans may not have cared last night, if tag teams are presented as a big deal, the fans will eventually come around to care about them. 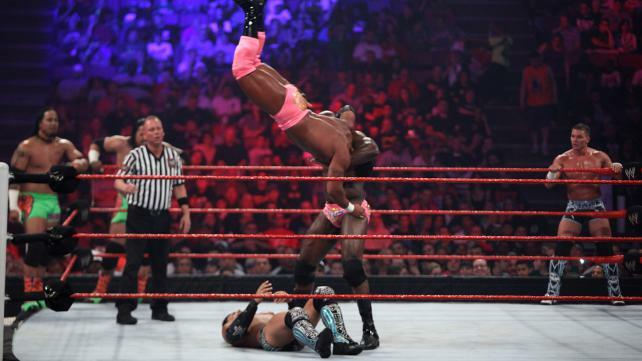 WHAT DO AJ, RICARDO AND RYBACK’S OPPONENTS HAVE IN COMMON? All are essentially non-wrestlers yet are more over than half the roster. As I mentioned in the blog about grabbing the brass ring and to reiterate the last paragraph, when wrestlers are given ample air time and get to showcase a personality fans will take to them. When wrestlers are thrown out for a quick match and treated like nobodies (i.e. Hunico, Heath Slater) fans will go hit the bathroom or concession stands. Right now there is no solid mid-card in WWE. Something needs to be done to rectify that and soon. As much as people hate on Vince Russo (I’ve done my share) one area you have to give him credit is he had a purpose for almost every wrestler. Even if it was super lame, at least there was a reason to a wrestler’s existence. THE MAIN EVENT Up until the cage match, I felt No Way Out was a solid yet unspectacular show. Other than the Tuxedo Match there wasn’t a bad match on the show. There just wasn’t anything that was must see either. You could skip this show and easily get caught up on RAW. Then the main event happened and I wished I’d stopped watching after the WWE Title match. Again, there was no good outcome given the stipulation. Also, off the top of my head, Big Show has never beaten John Cena on pay per view so why would I think this time would be any different? Having Brodus Clay, Kofi Kingston, Santino and Zack Ryder come down to try and keep Big Show from escaping the cage was a nice piece of continuity but Kofi, Santino and Zack were easily swatted away and seemed to disappear while Brodus Clay discovered Big Show is afraid of chairs the way Andre was afraid of snakes. Seriously, I’m supposed to believe Big Show couldn’t have escaped the cage because Clay was standing on the floor with a chair! Even if the Funkasaurus had hit Show, Show would have fallen downward to the floor. The most head scratching moment was the ending of the match. In TNA fashion, the referee got knocked out then Big Show slowly crawls out the door after Brodus went to grab Laurinitis. Cena climbs over the top of the cage to escape. As soon as Cena’s feet hit the ground, with the referee still knocked out, Cena’s music started playing. Who called for the winner? I was expecting both Cena and Show to get out, brawl around the cage and maybe show would throw Cena back into the cage right before the ref woke up. The Ref would then see Cena in the cage with Show outside and call the match for Show. The fans would be upset John Cena was fired and there would be drama as to what was going to happen next. Instead, the sound guy calls the match, McMahon fired Laurinitis and tonight on RAW we’ll probably get another GM who will quickly devolve into stereotypical biased GM. WRESTLING FANS BAFFLE ME I watched No Way Out at a restaurant with a group of wrestling fans I don’t know. 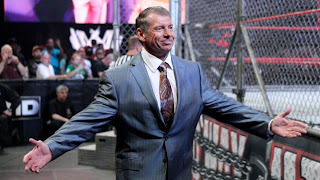 During Ryback’s squash the fans in attendance started chanting “Same Old S&*t!” Then when Vince McMahon came out for the main event the fans started cheering. So three months of the same action get insulting chants while a 15-year stale character gets cheers. I don’t understand it. CLOSING THOUGHTS Take away the main event and No Way Out was a solid 2 hours of good wrestling and a Tuxedo Match. Not worth $45 but worth the $10 I paid to see it. If you didn’t see it, unless you simply want to see some good wrestling, there’s no reason to go out of your way to see the show. The one major positive I can say is there was no Randy Orton, which automatically makes it one of, the better pay per views of the year. Are you glad John Laurinitis is gone? Do you think WWE will simply slide someone else into the GM position? Share your thoughts on our Facebook page. What would be awesome if they had the balls to hire Road Warrior Animal to set things straight.